Prior to 1741, the stretch of land that lies between St. Georges Avenue and Broadway (east–west) and the Rahway River and Westfield Avenue (north-south) was farmland, most of which was owned by Joseph Frazee, whose home stood on the property where the Water Works facility is presently located. In 1741, a Presbyterian congregation purchased a small piece of property from Frazee on the St. Georges Avenue end and within a year, built the First Presbyterian Church. The church prospered and the congregation grew and as members died, the church trustees bought land adjacent to their sanctuary for a burial ground. Over the next 200 years, the church would make more than a dozen different land purchases and eventually amass a total of thirty-one acres. The cemetery has a national importance in that it contains the mortal remains of Abraham Clark, a signer of the Declaration of Independence. The citizens of Rahway paid tribute to Clark in 1848 by erecting a twenty-two foot tall obelisk in his memory which is located a short distance behind his grave. 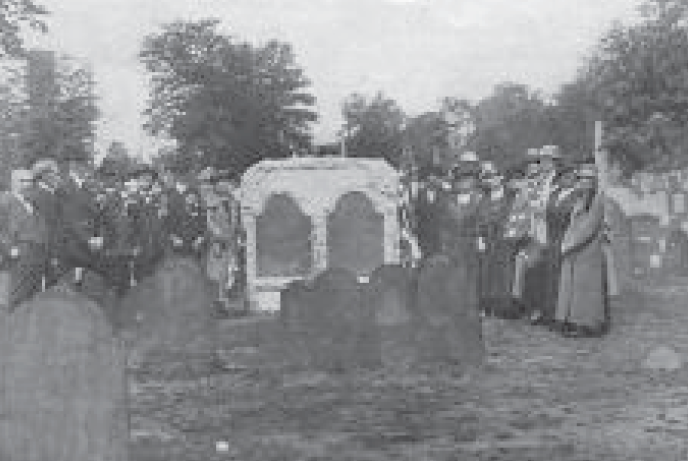 In 1924, members of the Daughters of the American Revolution Rebecca Cornell Chapter mounted the patriot’s gravestone and the stone of his wife, onto a large granite monument, giving it more prominence and ensuring its longevity. In close proximity to Cark’s grave are the graves of seventy-eight men who fought for the new country during the Revolutionary War. Each soldier has his own story including Private Richard Skinner who was killed by a British sniper during a skirmish at the six roads Rahway/Woodbridge border, and First Lieutenant John Brokaw who was killed at the Battle of Germantown, Pa. Captain Thomas Clark, son of Abraham, suffered greatly as a prisoner on the British prison ship, the Jersey. Although he survived the war, he only lived to age 37. To the west of the older section are thirteen graves of soldiers who fought during the War of 1812. Three hundred and four graves of Civil War veterans are scattered throughout many sections. History abounds in stories about these soldiers including John Trembly who fought for both the North and the South, John Johnson who was killed at Gettysburg, Captain James Bodwell who was the first man from New Jersey to enlist in the war, nineteen year-old drummer/musician Daniel Brower who died of typhoid fever following the 1st Battle of Bull Run, and Sergeant Salem Dutcher who fought for the Confederacy with the 7th Virginia Infantry. Twenty-nine soldiers who fought for the Union cause as members of the United States Colored Troops are buried within its grounds. The cemetery is the final resting place for soldiers from all our country’s wars. Interred within the grounds are twelve Spanish American War Veterans, 125 soldiers who fought in WWI, at least 149 graves of men who served during WWII, fifteen Korean War vets, eleven who fought in Viet Nam, and one soldier from the Iraq/Afghanistan Wars. Individuals of international and national fame and citizens who have interesting stories and backgrounds are also found in Rahway Cemetery. Fred Albee, the surgeon who pioneered bone grafting techniques and other advances in orthopedic surgery, lies with his wife in a granite mausoleum. During World War I, Colonel Albee was Chief of Staff of the Army’s General Hospital #3 in Colonia. The world-renowned surgeon made many flights to all corners of the globe including a flight in 1929 when he took his “flying clinic” to Central and South America on a plane piloted by Charles Lindbergh. Carolyn Wells, author of 170 books and regarded as America’s most popular mystery writer during the 1920s and 1930s, is buried in the cemetery as is Isaac Brokaw, a famous clock maker (1746- 1826). Earl Reed Silvers, educator, author, and Dean of Men at Rutgers University (d. 1948), and Seymour Williams, local architect who designed many homes and public buildings in Rahway and also directed the Historic Buildings Survey in 1934 covering a five state area have graves in the cemetery. Unique and special to the graveyard is the grave of a slave woman, Ambo, who has a headstone and is buried in the family plot of the family she served. A slave her entire life, Ambo died in 1847 at the reported age of 100. 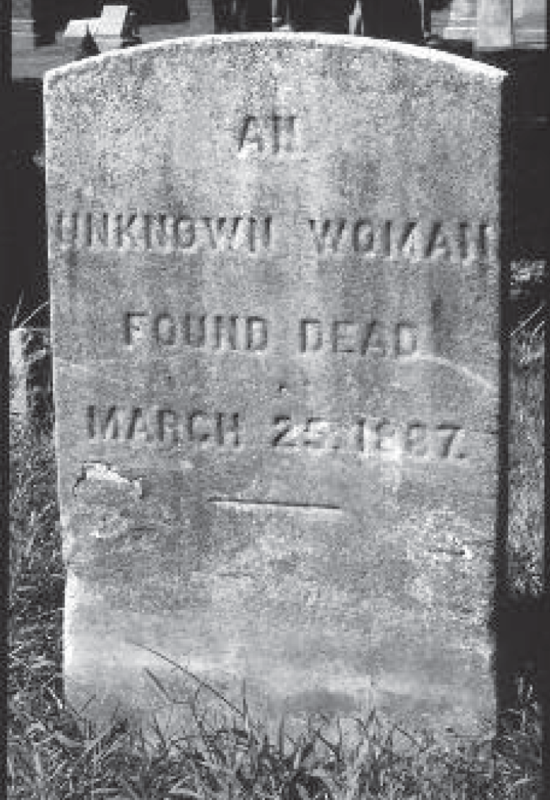 The most requested grave to visit, however, is the grave of the Unknown Woman. Murdered on March 25, 1887, her identity and the identity of her assailant have never been brought to light. The Rahway Cemetery is truly an outdoor museum and a place where research possibilities are limitless. (above) The cold, stark headstone at the grave of the Unknown Woman. (above) An outstanding effort of the Rebecca Cornell Chapter D.A.R. was the preservation of the stones marking the graves of Abraham Clark and his wife, Sarah. The monument was unveiled on Memorial Day, May 30, 2914. Molded bronze replicas were later placed over the original stones which were deteriorating.